john4jack (Corvallis, Oregon, United States) on 31 October 2009 in Transportation and Portfolio. This first photograph of the Sumpter series is totally out of order. But the main reason for going to Sumpter was the photographer's shoot on the Sumpter Valley Railway. No. 3 is the only operating Heisler engine in America; it carried the two passenger cars in which all of the photographer's rode (and from which they were repeatedly dumped to take photographs). CREATIVITY AND CRAFT - These quotes were on Dave duChemin's blog. The B&W processing and the vignetting effect are perfect for this subject and this image. Wonderfully done. I particularly like the inclusion of the rail in the foreground which give the scene even more depth. The quotes you added are a special bonus. I totally agree with the sentiments. The framing for this train is brilliant...and the white vignetting is effective. Even the over-exposed look is just right. BTW, thanks for adding the T. Tharp quotes. @Dulcie: Thanks, Dulcie. It was done with a preset in Silver Efex Pro. @Anina: Thanks. Tomorrow we head back to earlier in the trip. It's over two weeks until more trains. @Lorraine: There certainly is something about old trains. I dream to have the opportunity to travel in this kind of old train... must be so... romantic ! @Florence: It was especially romantic before we had been in and out of the cars 25 times. A lovely shot as it comes around the bend into the photograph. Interesting processing. I love the way the processing puts the emphasis on the engine. I LOVE steam locomotives, and this is a beauty! Thank you for sharing! @Betty: The super steam engine is coming in a couple of weeks. @Momo: Thanks. Love your comment. The iron horse, Jesse James and a whole bunch of indians...! Great shot and processing Jack. I like the vignetting and framing, good job ! Very cool framing for the shot. Very, very well done - and the result is perfect! I love this framing and beautiful processing ! Very nice ! excelente conmboy!! procesado de lujo! Completely classic, Jack. I love how that round frame has come up. 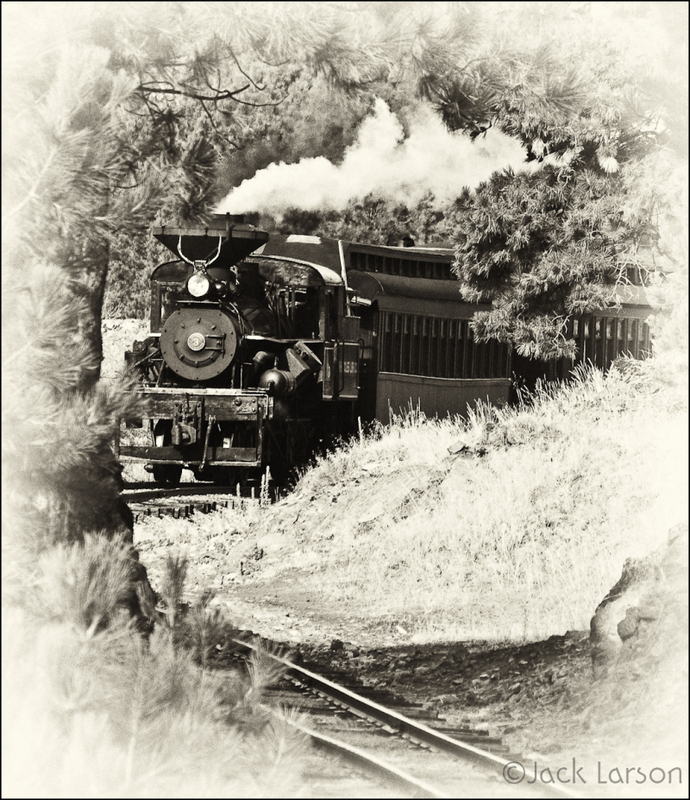 The vignetting and the b&w processing make this beautiful steam engine look like it is coming out of the past. I know that my husband, a lover of trains will fall in love with this picture, just as I have. Wonderful photography and processing. @Marion: Many thanks. I have a bunch more narrow gauge track trains coming up in mid-November as part of the Sumpter series. Beautiful old train and nice presentation who works very well. Excellent processing and composition. Looks like a poster for a movie. Outstanding! Remarkable composition and processing. I like the part of tracks in foreground. What an incredible photo journey this was. @Barbara: Thanks. I think that in large part it is the processing that makes this photograph. Interesting processing and effect. Nice. Extraordinary image. The two quotes are perfect. I guess there is a balance between craft, creativity, individualism, and just having fun. I've noticed lately that my photographs seem to be a reflection of the glasses I'm wearing. LOL True statement. @Cricket-TammyWarren: My belief is the creativity trumps craft, but an internalization of craft greatly enable creativity. And in my photography, fun trumps all of it.